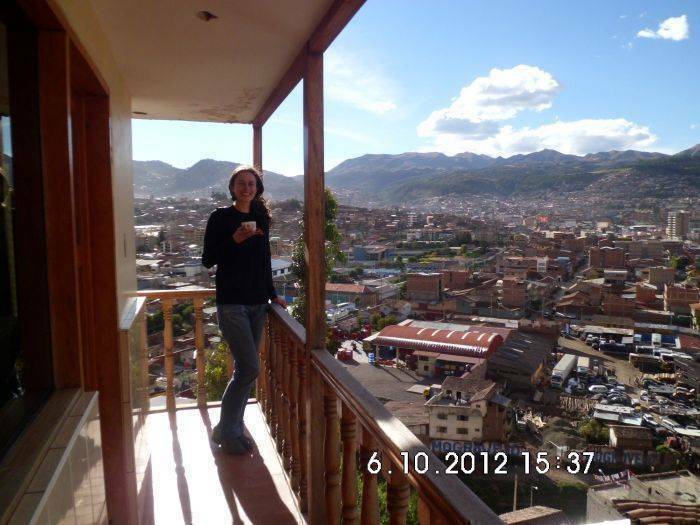 Rooms are very nice and clean with balconies with the best view of cusco, we will give you assistance all the time and this place will be just like your home. We prepare meals or you can cook here and do whatever you like. we have green areas to read and relax or enjoy having a nice cup of coca tea or for smokers. If you are planing to volunteer in an orphanage contact us, we work and help several places. Please contac us for more info on facebook. 300 square meters, with balconies and the best view of the city, green areas ( we accept pets) ( areas to smoke), peaceful and quiet place. Confortable beds, nice bathrooms and clean. save concrete construcctions. rooms with balconies and the best view of the city, we have simple, doubles and triple rooms. Poseemos 5 pisos, con construcciones seguras y diseñadas para satisfacer sus comodidades y hermosas terrazas que permiten tener una romántica y bella vista de la ciudad, ademas contamos con patios llenos de flores y plantas donde podrá relajarse y disfrutar de los ambientes tranquilos de la casa. El comedor y la cocina estan completamente equipadas con todo lo necesario para poder disfrutar los deliciosos platos preparados por nuestro chef, también tenemos una amplia sala donde podrá utilizar las computadoras gratis, relajarse leyendo un libro o intercambiar experiencias con otros visitantes. Porfavor siéntase como en casa si desea prepararse algún alimento o bebida con toda libertad, caminar por los bellos jardines y terrazas que tenemos o disfrutar de un mate de coca o fumar un cigarro disfrutando de la hermosa vista de la ciudad. Estamos seguros que no encontrara otro lugar que le brindara todo lo que le podemos ofrecer en esta su nueva casa. safe place and quiet, best area to do social work and volunteering, there is a minihospital 1 block from our place. parking zone and full illuminated at night. Ask for our best cheap prices! according to the season. Only big groups or number of days in house. pay everything when you arrive to our place. just send us your complete arrival information. we are located in a safe area and very quiet, just 10 minutes from the airport and 4 minutes from the bus terminal, main square is located just 10 minutes or less by car. free transportation from the house to the main square.